and see dozens of killer whales. we’re still standing there on our legs. A perfect description of the many three-day conferences I’ve been to, at least what I remember of them. Absolutely delightful. Cheers, Peter. The conference I attended in real life came a close second in surreality to the one I imagined here. It was in a gigantic megahotel in Nashville and when I came out of my room on the first morning I noticed that they had a rainforest growing outside the door, complete with a waterfall and fake rocks. I was simultaneously attracted (to the plants) and repelled (by the artificiality of it). The other odd thing about the place was that many of the employees had three v-shaped scars on their foreheads, like upside-down chevrons, and turned out to be Dinkas, refugees of the war in the Sudan. I can barely remember the conference itself, but the artificial rainforest and the Dinkas stay with me. 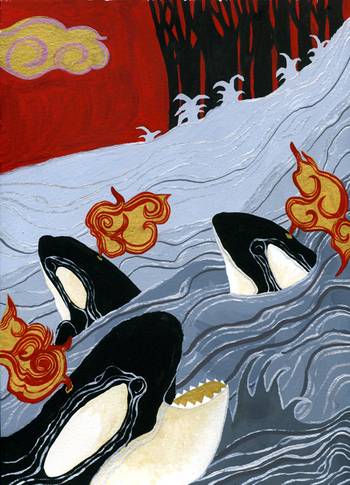 It all made me want to run far away–perhaps to swim with orcas like the ones in Emma’s painting. Nathan, I enjoyed this, too. I must have been to similar conferences. I laughed out loud at “day two.” I love Emma’s piece, too. I love your poem, it is off the wall different from what I would expect someone to write, it is fabulous!